A classic designed by the best Naval Architect of her time and issued from his most reproduced design in history. She is a not so far relative to the Nautor Swan 36. She is in very good shape. Model:Design n. 1710/C28, 25' R.OR.C. The n. 1710 drawings from Sparkman & Stephens have been the most successful ever in their production: it was produced by 17 different Yards. They say that it derived from the design of the famous Hestia. In fact the rudder attached to the keel was already outfashioned by the famous Clarionet, Rainbow and Rounabout, issued from drawings n. 1857. Compared to Hestia, the 1710 design has the same dimensions but a longer overall length. It was also thought out to be produced in series as it was commissioned by the Italian Benello yard which built on these plans the famous Gaia 36 range of 16 glassfibre units. Also Cheoy Lee built three 1710 units: the Sigma 36 (the first being 1710/C8). The most famous builder of these boats thought was Finnish Nautor which built her first model, the Swan 36 on these plans (1701/C39), modified with a separate rudder on skeg. Nautor built the first unit in wood, to use her as a mould for the GRP version and that 1710 unit is the only wooden Swan of the history. Other famous boats, built over these same drawings were the Diana III (1710/C6 built by Walsted in Denmark), winner of the 1965 One Ton Cup and Cybèle (1710/C39 built by Poul Molich also in Denmark), third at the 1967 One Ton Cup, both were wooden boats. Bilbao based yard Udondo built at least three vessel using the 1710 design: Fra' Diavolo (1710/C14, owner Mr. Nicolaidis), Asu (1710/C28, owner Mr. Ferrer), which is the boat we are introducing herewith, Nananay (1710/C35). These two follow the lines of the second keel version of the 1710, with a bigger rudder with marked lower corner compared to the Benello built boats, identical to the Hestia hull. As we already wrote, the Swan 36 had a separate rudder with different keel shape and a reversed transom, something which could have been possible (but it never was done) also in the Udondo built boats, as it is suggested in the original plans. To summarize, the 1710 was at the moment the perfect racing boat able to allow the owner also for pleasant family cruises. The Hestia, Diana III and the Swan 36 illustrate this virtue.The Asu had a tranquil cruising life and her present owner found her in good shape some fifteen years ago. He wanted to restore her and gave her some important improvements as the saloon butterfly hatch, the cambered helmans seat and a new galley lay-out fine for occasional use. The Asu is a magnific vessel in good general shape, fast and easy to handle. She reaches her speed very fast, even in low wind. 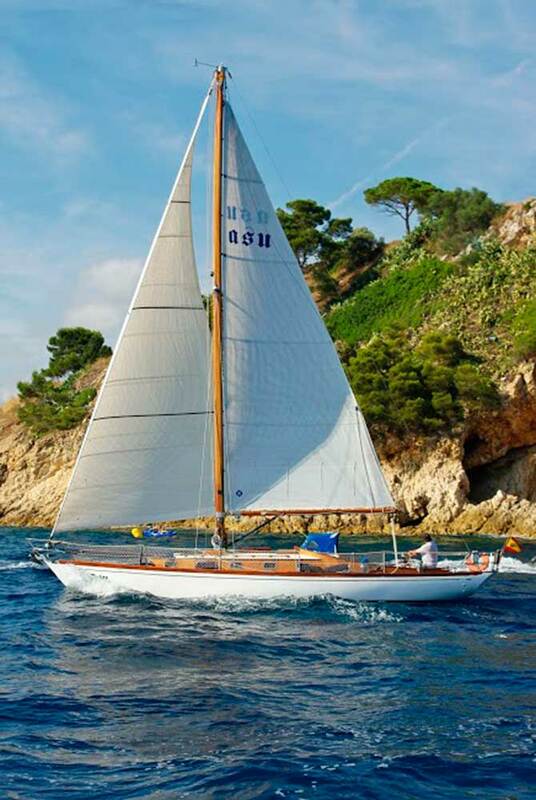 She can still be nowadays a protagonist of the classic races and go also for family cruising.